This Starfighter (USAF serial 62-12247) was hit by 20 shots of 20mm training shells from another F-104G while at 15 minutes alert duty at CCK Air Base. Personnel was performing a missile circuit test but with its switch at cannon position. This caused the canon to fire hitting 4306 severely into the aft fuselage. It was declared damaged beyond repair and was written off by 1st Depot in Pingtung AB. Official wfu-date was August 6th, 1996. It was scrapped later on. Photo beneath was taken at Pingtung showing clearly the damage in the back (black area). it was used for spareparts for some time. 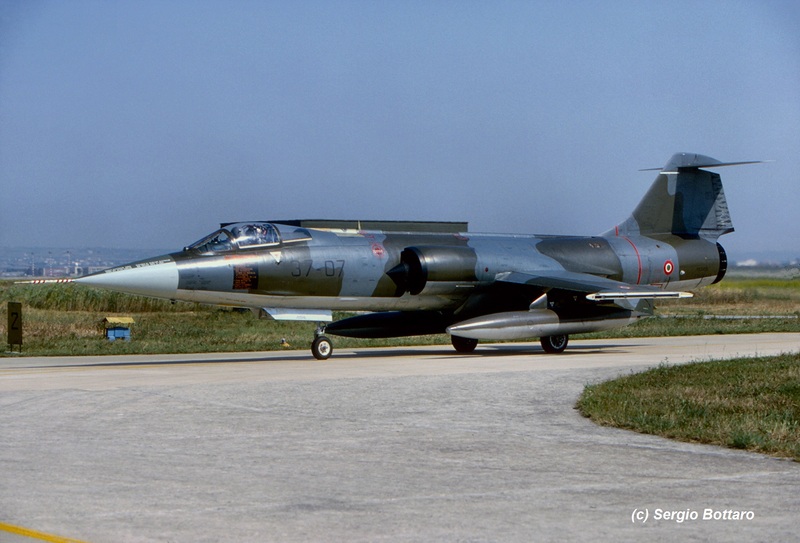 This Starfighter, operated by 4Stormo, 9 Gruppo at Grosseto Air Base, crashed after an engine failure due to a fuel-leak. The pilot, Ten. Lorenzo de Stefano, could eject in time and was safe. 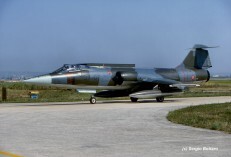 The F-104 crashed into a hill North of Castiglione, between the villages Vetulonia and Buriano, Italy, 3Km from Grosseto city. The aircraft had arrived just recently with 9 Gruppo. The pilot reported “aircraft-on-fire” after take-off from Grosseto. While landing the pilot, encountered problems with keeping the aircraft under control. After the pilot ejected the aircraft continued its landing pattern and crashed after 5 kilometers on a large area within the Industrial zone near Grosseto. No people on the ground were hurt. Some witnesses declared that the airplane “has glided down to earth” and then it broke into fire. Beneath a photo taken at the crash scene after the crash, from the AMI flight safety magazine (thanks to Eugenio Vellorso). Shot down as unmanned drone on purpose and crashed into the ocean near Iwo Jima (ex 76-8709). Shot down as unmanned drone on purpose and crashed into the ocean near Iwo Jima (ex 46-8621). Shot down as unmanned drone on purpose and crashed into the ocean near Iwo Jima (ex 76-8707. Shot down as unmanned drone on purpose and crashed into the ocean near Iwo Jima (ex 46-8635). Shot down as unmanned drone on purpose and crashed into the ocean near Iwo Jima (ex 76-8708). Shot down as unmanned drone on purpose and crashed into the ocean near Iwo Jima (ex 76-3692). This TF-104G (USAF serial 63-8456) crashed into sea on a normal mission near the Matsu islands. The aircraft developed an inflight emergency around 04:58 due to a hydraulics failure, after take off from Hsinchu at 04:34. It was on a Sunday morning! The pilots, Maj Li Chi-Ron and LtCol GE Ji Xian (GER Ji Shen), could gladly eject in time and were picked up by a SAR S-70 Helicopter. 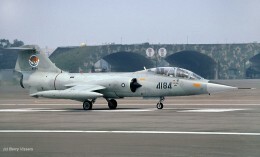 It had just received 11AG badges (ex 12SMS) This was the last RoCAF 104 crash. 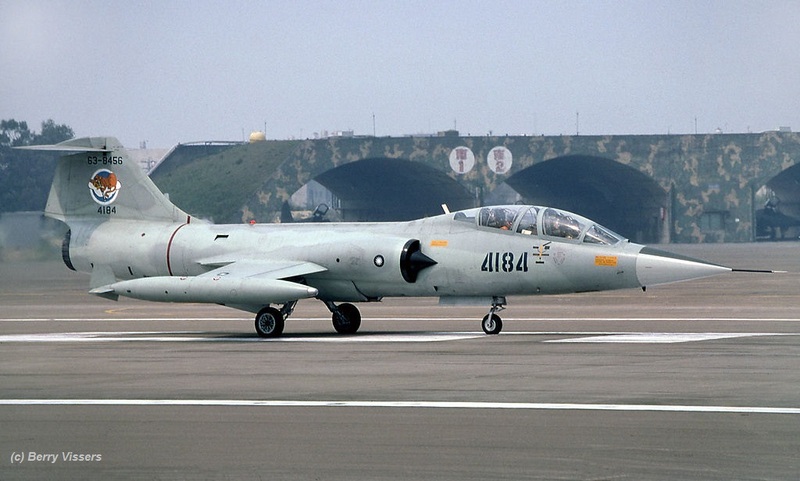 Beneath a photo showing the unfortunate aircraft with 12 Smsq markings taken at Hsinchu on March 7th, 1994, by Berry Vissers. 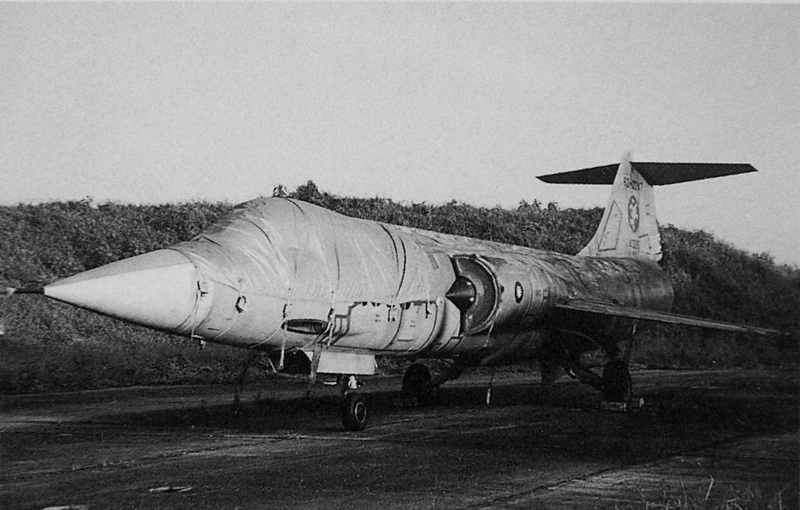 This Starfighter crashed into the sea due to an unknown cause. 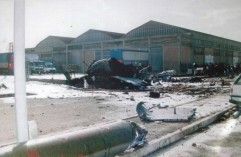 The pilot, Michelangelo Trimarchi of 27 years, ejected from the aircraft but sadly died in the incident. He was first missing before his body was found. The rests of the airplane was found in the sea on 20 meters. (Some believe it happened 13 November). Beneath a photo taken by Sergio Bottaro in June 1996, a few months before its tragic loss.